As the design of the G&N system was being finalised in the early 1960s, a conflict arose between those who designed the equipment and those who would fly with it. The designers at the Instrumentation Laboratory at MIT led the field of applying mathematics to the problems of guidance, whether in a submarine, an aircraft, a nuclear-tipped missile or travelling in space. They saw the problem from a wide context in which all guidance could be reduced to equations that modelled the solar system as it sat surrounded by the stars. Their fundamental point of view was an inertial one, which was expressed during Apollo's gestation by an intention that the spacecraft's attitude should be displayed as a set of numbers with respect to inertial space. The crews, on the other hand, were pilots, and pilots see flight largely in terms of movement with respect to the horizon of whatever planet (usually the Earth) they are flying over. Their point of view dealt with a local frame of reference that stayed aligned with the ground beneath their spacecraft, even as they flew around a curved planet. These two viewpoints on spacecraft control influenced the Apollo guidance and navigation system as it evolved at breakneck speed during its development; the inertial point of view dictating its fundamental structure, but with the astronauts' preferences heavily influencing the final mode of operation because they had experience on their side. They had cut their teeth on the Gemini flights of 1965 and 1966 that had taught NASA how to operate in space. They pointed out that most manoeuvres needed to be carried out with respect to the ground below, especially the all-important rendezvous manoeuvres on which the Moon-bound flights relied. 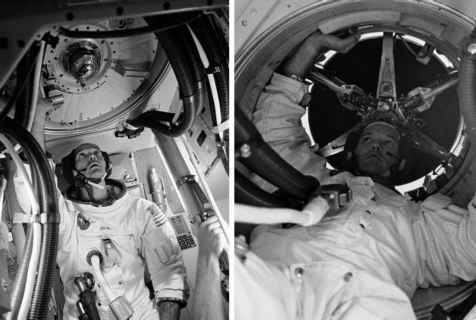 Since the Apollo G&N system had been largely designed by the time they had gained this experience, both hardware and software modifications had to meet the crews' expectations. In particular, the crews insisted on having the '8-ball' FDAI display, which was very similar to the artificial horizon in an aircraft cockpit with which they were already familiar. Also, by the time Apollo flew, the ORDEAL had been introduced, which was a quick-fix add-on that had to be installed in the cabin after launch, effectively turning the 8-ball into the artificial horizon that crews preferred.